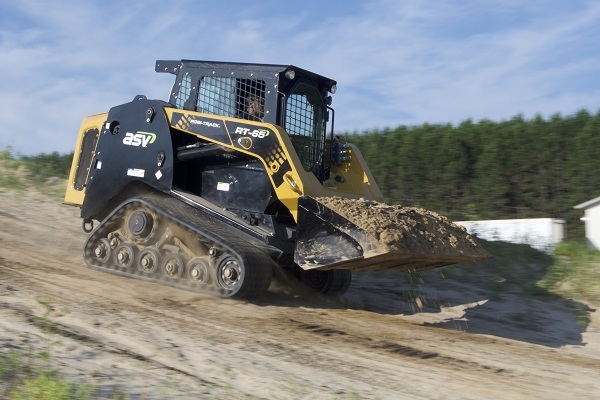 ASV Holdings Inc. introduces the new radial-lift RT-65 Posi-Track compact track loader. ASV, an industry-leading manufacturer of all-purpose and all-season compact track loaders and skid steers, builds the loader with maximum serviceability, reliability, productivity and ASV’s patented Posi-Track undercarriage for superior performance. The CTL is ideal for digging and ground engagement work in construction, excavation, landscaping, snow-clearing and rental applications. ASV highlighted the new RT-65 at The ARA Show 2019 in Anaheim, Calif. The RT-65 offers premium reliability and power. Its turbocharged 67-hp Deutz 2.2-liter diesel engine produces 184 ft-lbs of torque that the drive motors transfer to ASV’s patented internal-drive sprockets. Internal rollers reduce friction loss in the undercarriage, resulting in maximum power being transferred to the track regardless of drive speed. The Tier 4 Final engine requires no regeneration, exhaust sensors or diesel exhaust fluid. The RT-65 features a rated operating capacity of 1,925 lbs and a tipping load of 5,500 lbs. It is 66 in. wide and has a 116.5-in. lift height. Standard joystick controls make operation easy and intuitive, while a self-leveling system allows attachments to stay at a set position while lifting. Operators can use the unit with all standard attachments. ASV manufactures its loaders with its patented Posi-Track undercarriage. The innovative system allows customers to use the RT-65 as an all-season, all-weather machine with maximum control, flotation, traction and pushing power in steep, wet, muddy and slippery conditions. The system features a flexible rubber track with internal positive drive sprockets to provide superior traction and track life. The open-rail and drive-sprocket design, rather than the enclosed tub system seen on many competitive undercarriages, results in increased sprocket and bogie life along with easier and faster undercarriage cleaning. All of the wheels are exposed in the undercarriage, allowing material to spill out, reducing the risk of abrasive material getting trapped and wearing away at components. In addition, ASV loaders’ tracks feature as many as four times more ground contact points than competitive steel-embedded tracks. This spreads the unit’s weight evenly for lower ground pressure, extra flotation on delicate surfaces, and less risk of turf damage. The result for the RT-65, which contains 12 contact points per track and 15-in.-wide tracks, is a ground pressure of 4.3 psi. The RT-65’s many contact points and guide lugs also virtually eliminate the risk of track derailment. ASV designs its Posi-Track and skid-steer loader frames separately to provide customers with the highest performance from each machine. This is different from other manufacturers that use a single chassis for both compact track loaders and skid steers. The dedicated frame for the RT-65 results in a 12.9-in. ground clearance. This allows the unit to easily travel over logs, stumps, rocks and other obstructions with less risk of getting hung up. The purpose-built chassis also provides a 37-degree departure angle, decreasing the risk of the machine getting stuck when starting to climb a steep hill. Get more ASV news here!